In Farmerama players are able to build up their own farm, growing crops, tending to livestock and getting involved in a number of challenges, events and games in this colourful, family friendly, free to play MMO RPG that can be played directly in your Internet browser. With a strong sense of community with many opportunities to have friendly competitions as well as cooperative play to help your fellow farmers, Farmerama is fun and casual yet has a huge array of features to explore. Players start with their own field where they are able to place down a number of buildings, fertile land and decorations to add a unique personal touch to their farms. At the farmhouse players are able to build up customers and gain delivery points and sell off their homegrown stock. Growing plants, veggies, fruit and livestock doesn’t come easy and players must tend to their resources carefully, actively feeding and watering when necessary and storing their well-earned stock in their barn. Heading into the city players are able to purchase everything they will require on the farm, from animal housing to trees as well as decorative items such as fences, flags and statues. Players can also trade with other players in the farmers market, trading for items you may need or simply selling your supplies to a potential buyer. Players can also make money deposits in their bank and send and receive mail at the post office. There are a number of quests and events that are often made available, typically themed and seasonal, where players can get involved in various challenges to earn more XP, coin or even rare unique items that can only be acquired through successfully completing the challenge. With these new events and new items there is always something to work towards. 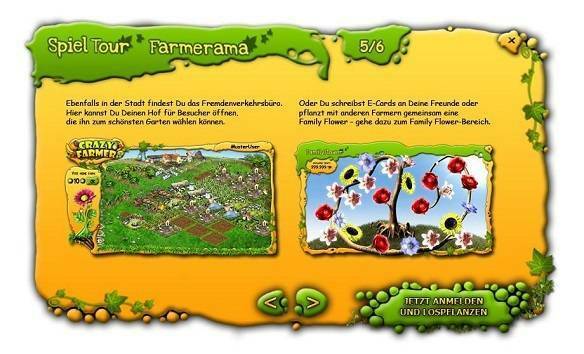 As Farmerama is a social game players make be interested in joining the community flower patch, an idea formed by other farmers to help create community bonding. To join players must plant a flower by the one of their own seeds from their crop and then message a friend inviting them to come and join the community flower patch. Once the player has accepted this in by they too can plant their own flower and then invites another player to join them.